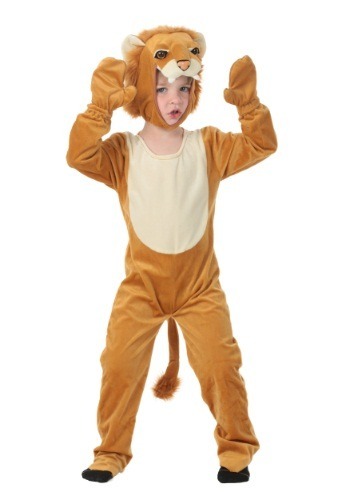 Adorable little lion costume for your little one! Awwwww... isn't he the cutest lion you've ever seen? You can take him to the top of the rock to show him off to the entire kingdom, but you might not want to rush things. Before you brag and boast about your little lion cub, you better make sure that he's outfitted with the perfect lion look. This plush lion costume is sure to set him up as the sharpest looking member of the pride! This jumpsuit costume will have any toddler ready to practice their roars and start growing out their claws! The polyester velour will keep them cozy and comfortable. (Which will be useful if the need to take a spur of the moment cat-nap!) But it's the plush details on the separate hood headpiece that will have your little one standing out as a top cub. With eyes and a little lion's mane, every other animal is sure to respect him as a future top ruler of the animal kingdom. Just teach your little one how to show those fangs, and we're sure they'll be ready to roar in no time!